Reclaim the Seeds was started in 2012 in Amsterdam as a seed fair with stalls from all over the Netherlands. At the fair, seeds can be swapped, bought and given away, and you can also find books and zines relating to critical topics surrounding agriculture. Each year the event takes place in different part of the country to attract a new audience on top of the loyal participants that attend every year. As part of the event, there has always been a workshop programme about practical and political topics related to seeds and biodiversity. 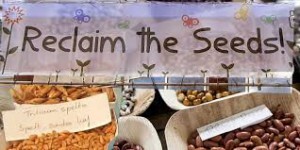 Reclaim the Seeds was created as a protest against the planned revision of the EU seed law. This new law has been stopped, but the popular event is still used to raise more awareness about the role of large corporations and patents. ASEED has been involved in the organisation of each Reclaim the Seeds event, always alongside local people and organisations. This year alone we had people from 10 different countries helping out with the preparations and during the day itself. This diversity was cause to write and publish this nonextensive overview of seed activities in several countries. Seed diversity is essential so as to ensure that our agriculture is capable of adapting to changing environmental conditions, such as climate change, diseases and pests. It allows for plants to flourish under extreme conditions and in remote areas, making it possible for food to be grown wherever humans live. Arche Noah, an organisation that actively campaigns on behalf of crop diversity, stated that 75% of crop diversity has become extinct since the 1900’s. The industrialisation of agriculture, laws, corporate interests, consumer behaviour, armed conflicts, environmental disasters and the disappearance of small-scale farming amongst other factors compound the danger to seed diversity on a global level. Arche Noah advocates for a more sustainable EU seed law that will maintain seed diversity and protect the rights of farmers, gardeners and consumers in order to preserve biodiversity. Farmers and other seed savers all over the planet are working together to protect and stimulate diversity in agriculture. This includes traditional farm seed exchanges of local varieties, as well as regional, national and international networks for lobbying work, research, resources and information sharing, education, public events, programs, monitoring and other forms of activism. One example of an international network is the Seed Freedom Movement – ‘The global movement to protect seed freedom.’ In 2014, they organised the European Seed Freedom Tour, travelling through Greece, Italy, Spain and France, linking together local seed saving initiatives and organising public events with debate s, film viewings and local seed exchanges. There are several European networks active around the seed issue, in which local seed saving initiatives work together. One such group is the Vienna group. The group joined forces during an international meeting in Vienna several years ago to draft the international “Vienna declaration”: a declaration against EU proposals for new and very restrictive seed legislation. The controversial EU seed law was finally rejected by the EU parliament. But the industrial agriculture (big AG) lobby is still pressing for new EU legislation. The Vienna group continues to share information and updates on national and EU seed legislation, comparing experiences in how the law is applied in different European countries, and keeping a close eye on the political and legislative developments in Brussels. The Vienna group meets annually. Another overlapping pan-European seed cooperation is the campaign for Seed Sovereignty “No Food Sovereignty without Seed Sovereignty” which runs a website, creates petitions and maintains a contact list that becomes operational when there is an international mobilisation to support diversity and seed sovereignty. The massive international protest march, seed exchange and workshop/debate weekend in Brussels, April 2011 formed a major source of inspiration for the Reclaim the Seeds weekends in the Netherlands. No Patents on Seeds is another initiative involving seed diversity and pressure groups from around Europe in their struggle against the patenting of seeds and life-forms by the European Patent Office (EPO). Apart from joint legal battles against particular patents (e.g. the broccoli and tomato patents) No Patents keeps a close eye on applications for European patents on plants and seeds. Their activities include a website, information and presswork, petitions, international meetings, newsletters, advocacy work and street protests. Save Our Seeds is a broad platform involving hundreds of organisations from all over Europe organising regular international gatherings on a variety of subjects and strategies, centred on defending seed diversity against GMO contamination. These are but a few examples of international cooperation on seed diversity. Many more European organisations or networks operate within an international context. In this context it is worth mentioning excellent independent research groups such as the ETC group or GRAIN that produce in depth reports on the local and global seed and agricultural input markets. Corporate Europe Observatory covers the big AG- and other major business lobbies in Brussels. Graines de Vie (Grains of Life) is a French citizens’ movement for saving vegetable and fruit varieties in danger of extinction. Following a report conducted by the Food and Agriculture Organisation (FAO) of the United Nations which stated that over 75% of our edible varieties have disappeared in the past century, the initiative aims to re-appropriate the basis of our food sovereignty by promoting an active liberation of the seeds. After a successful crowdfunding campaign backed by the well-known French agroecologist Philippe Desbrosses, Graines de Vie formed 200 ambassadors engaged in sharing their knowledge on seed saving to over 50 new people within a year. The ambassadors were selected from various backgrounds and regions of France, and received a free course in the Sainte Marthe conservatory on all the secrets of reproduction and conservation of seeds. On top of that, the funds raised by the campaign were used to produce a series of tutorial videos on seed saving methods, which were available online for free. Graines de Vie is one of many French movements and practices engaged with the liberation of peasant seed varieties. Freeing the seeds by democratizing traditional knowledge over their reproduction and conservation is their ultimate goal. Seed saving is the practice of saving seeds or other reproductive material (e.g. tubers) from vegetables, grains, herbs, and flowers for use from year to year for annuals, nuts, fruit trees and berries for perennials and trees. This is the traditional way farms and gardens were maintained for the last 12,000 years. In recent decades, beginning in the latter part of the 20th century, there has been a major shift to purchasing seeds annually from commercial seed suppliers. Much of the grassroots seed-saving activities today are the work of home gardeners. Over 70% of the Nigerian populace owe their existence to agriculture and agro-allied activities with agriculture contributing 20% of the Gross Domestic Product (GDP) and accounting for 5% of total export. Agriculture provides 88% of non-oil earnings in the country with crops contributing 85% of the agricultural GDP. About 94% of the agricultural output is accounted for by small–scale, subsistent farmers cropping less than 2 hectares. The Seed Industry in Nigeria is in its infancy with the National Agricultural Seeds Council charged with the overall development and regulation of the national Seed Industry. 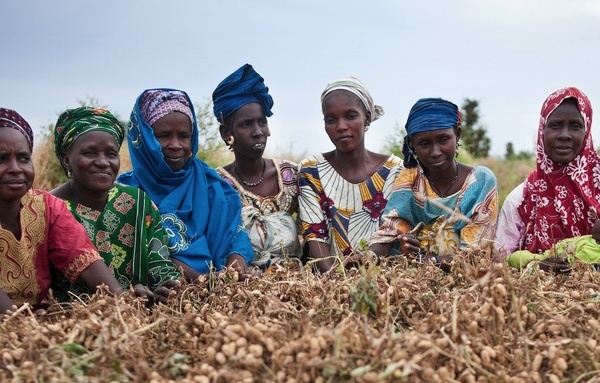 Farmers in Nigeria save their seeds from season to season and exchange seeds amongst themselves, however the scale and sustainability of this practice is not appreciable. Most of the seeds planted by farmers in Nigeria come from local and community saved seed resources. Farmers save seeds like pepper, yams, gourds, soybeans, melon, maize, beans, millet, groundnuts, cassava etc. Any effort to address food security must equally tackle issues dealing with seed saving. Biemond et all (2013) conducted research on the health of farmer’s saved maize seeds in north east Nigeria and found that none of the samples tested passed the requirements demanded for certified seed of the National Agricultural Seeds Council in Nigeria. Another study conducted by Bankole et al (2004) reported that melon seeds, an important delicacy used to prepare soup in the southern part of the country cannot be stored for more than two months after which seeds are contaminated by aflatoxin B1. Seed saving practices are encouraged through different research projects by the International Institute of Tropical Agriculture (IITA). Projects include development of new yam varieties with desired agronomic and quality traits. The scientists have been able to progressively find and analyze the genetics of yam resistance to anthracnose and viral diseases. In 2013 IITA successfully grew seed yams in the air using aeroponics technology. Nigeria belongs to the West African Seed Alliance whose goal is to set up a sustainable commercial seed industry capable of ensuring that small-scale farmers have access to high quality seeds and plant materials and assist in the growth and development of viable agricultural input systems. Farmer-led seed saving initiatives are not popular in Nigeria as many countries in Africa promote commercial seed provision and modernisation. Addressing the misconceptions about farmers’ seed networks Oliver Coomes et al (2015) defined the networks as seed transfer (and other generative material such as cuttings, pseudostems or tubers) from domesticated or undomesticated plants via farmer-to-farmer gifting, swapping, bartering, or purchase, and also via trading or sale which occurs outside of the commercial seed sector and formal regulation. Not many farmers in the Netherlands are using their own seeds, even fewer than in some other European countries. For quite a long time there has been specialisation in Dutch farming which also means that there have been many professional plant breeders for a long time. They generally started out as small family businesses, later growing and merging and becoming large companies exporting their seeds all over the world. There is still a lot of plant breeding and seed production in the Netherlands. In the past decades, some large Dutch companies have been taken over by companies like Monsanto and Syngenta. This history and specialised farming also resulted in relatively little protest by farmers against GMOs and patents. For a long time, everybody was accustomed to plant breeder’s rights and so the step towards patents is not such a big step for many farmers and other people. But there are some organisations and networks resisting the new laws, patents and market concentrations. At the same time there are active people, collectives and networks involved in seed saving. There is an overlap of those two groups and in general the awareness and seed saving practices have been growing over the past few years. Netwerk Eeuwig Moes is a network of gardeners, seed breeders, city farmers, historical gardens and heirloom gardens that aims to preserve and use old, often forgotten, species and varieties of vegetables and grains. In 40 years Ruurd Walrecht has built up a large number of those crops and Eeuwig Moes is trying to keep this collection alive. Netwerk Eeuwig Moes is part of Stichting De Oerakker, a foundation that wants to be the umbrella organisation for all Dutch initiatives that are preserving old heirloom crops to protect the biodiversity in our gardens and on our fields. Stichting Zaadgoed is a not-for-profit Non-Governmental Organisation (NGO) that is a part of the European Network ‘No Patents on Seeds.’ They’re active with court cases against patents and organise courses to stimulate more people to become seed savers. Their main focus is on professional farmers rather than hobby gardeners. ProSpecieRara Netherlands is a new organisation based on the Swiss organisation with the same name. They are committed to the conservation of biodiversity of cultivated plants and farm animals and one of their main goals is to involve people in the seed production and maintenance of regional and historical varieties. Online there are many forums facilitating seeds saving and seed swaps. Often those are part of permaculture networks. Obviously this is not a complete list. On the list with stalls present at Reclaim the Seeds you can find many other initiatives, collectives and gardeners who are all somehow involved in the seed saving movement in the Netherlands. – Flip Vonk, part of ASEED and involved in Reclaim the Seeds since the first edition. The Irish Seed Savers Association (ISSA) is based in Scariff, Co. Clare and it is one of the most prominent associations in Ireland in terms of actively promoting biodiversity and seed saving initiatives on a national level. The ISSA aims to: protect, conserve and utilise Irish plant genetic resources including rare heritage seeds, grains, vegetables and fruits; promote agricultural biodiversity for food security; educate the public on agricultural biodiversity and food security through inform ation and workshops; research seed, grain, vegetable and fruit varieties suited to Ireland’s temperate maritime climate; and to raise public awareness about the vulnerability of Irish agricultural biodiversity in schools and community groups through providing workshops. They also wish to begin with e-programmes/workshops online so as to make the promotion of biodiversity and seed saving more accessible to all. The ISSA has also successfully established a seed bank that contains more than 600 rare and endangered vegetable varieties, something that is massively important should we wish to maintain the earth’s biodiversity. They are also affiliated with the Irish Seed Savers Network which is an initiative mainly consisting of organic growers who are collectively maintaining open pollinated varieties that have a good potential for market gardeners and small-scale horticulture. Brown Envelope Seeds (BES) is an open source seed initiative based in Co. Cork that provides the public with open-pollinated, open source locally grown vegetable, herb and grain seeds. Similar to the ISSA, BES also facilitates workshops, farm walks and garden visits to the general public. There are also many local and small scale seed saving initiatives in the form of co-ops and organic community gardens scattered throughout Ireland, all with the aim of preserving seed diversity and promoting local food sovereignty in order to protect the earth´s biodiversity. There are many groups and organisations in Greece that prioritise the preservation of biodiversity through the medium of seed saving and various other initiatives. One such group is AEGILOPS, the Greek Network for Biodiversity and Ecology in Agriculture. Amongst other things, AEGILOPS aims to: reuse local varieties of (endangered) agricultural plants; develop varieties of plants adapted to local conditions of production; highlight the value of locally adapted genetic material for the application of ecological farming; succeed in reproduction and exchange of genetic material amongst its members; distribute useful information, experiences and traditional knowledge; highlight the role of ecological farming for the preservation of biodiversity in agriculture as well as the preservation and s afeguard of farmer’s profession itself; upgrade the role of the farmers in the preservation of biodiversity of the agroecosystems as well as placing an emphasis on their right to take part in the management of and benefit from their genetic richness. Peliti is another such organisation in Greece that was established in order to collect, conserve and promote local seed varieties, help the exchange goods and services without the mediation of money and to create an alternative community with the preservation of local biodiversity at its core. Peliti has successfully established a seed bank consisting of local seed varieties that is growing by the year. Annually, Peliti also organise a Panhellenic Seed Exchange festival that consists of seed swapping, workshops and sessions about seed saving, seed laws, and other related topics. The old seed varieties exchanges began more than a decade ago in Lithuania. It started due to the resistance of many small scale g ardeners and farmers to the growing hybrid seeds distribution at the market. However, small and unofficial seeds exchanges happens in Lithuania from the ancient times. Due to this practice Lithuania has many plants that are ¨really local¨. These local varieties are more valuated than foreign ones due to their better resistance to pests and resilience to climate fluctuations. More than 3 thousand examples of old seed species and varieties are kept in Lithuanian Plant Bank (Lietuvos augalų genų bankas). This bank often provides seeds to organic farmers in the country. Nevertheless, farmers cultivating old varieties still fell the big shortage of old plants and vegetables seeds. Therefore, it is expected that the amount of the seed exchange events and seeds saving initiatives will grow in the following years. Because of its geography and culture, Belgian seed initiatives and groups have strong links with both Dutch and French organisations. It is also worth noting that community gardens of all sorts are very popular in Belgium, whether they are meant to welcome kids, families, workers or urban farmers in progress. Les potagers urbains / Stadsmoestuinen show a good example of the networking dymanic of different entities from Bruxelles region. As for seeds-related initiatives, let’s mention the local branch of the French Kokopelli, which was started in 2003. They stick to the core principles of the organisation by promoting seed freedom. Meanwhile, Les Jardins de Pomone focus on teaching how to grow and cook old varieties of veggies. On another scale and for a different public, Zelf Zaden Telen works with professional growers. Its goal is to maintain and develop genetic diversity on fruit and vegetable farms and it provides a lot of technical information to its members. Velt –de Vereniging voor Ecologisch Leven en Tuinieren– targets a less specialised audience. It counts in total more than 16 000 members in Vlanders and the Netherlands but the seeds working group is more modest, yet growing. By organising regular meetings, events and workshops, they aim to develop a network of gardeners who multiply and select their seeds. This seed group also intends to inform a wider public about seed-related questions such as GMOs, hybrids, organic farming and to share very practical skills. They recently organised the first Reclaim the Seeds weekend in Lier, Belgium.